Coastal communities in Isabela and Cagayan provinces are being evacuated as Typhoon Rosita bears down on the Philippines. Storm warning levels have been raised today (Monday, October 29) as the typhoon — international name Yutu — threatens storm surges, landslides and floods triggered by heavy winds and rain. The typhoon, which caused havoc last week when it slammed the US Northern Mariana islands, is set to make landfall tomorrow morning and move across the main island of Luzon before leaving the Philippines 24 hours later, the state weather agency PAGASA has said. By mid-morning today, Rosita was about 250 miles east of the mainland and had weakened to sustained wind speeds of 93mph, with gusts of 115mph. 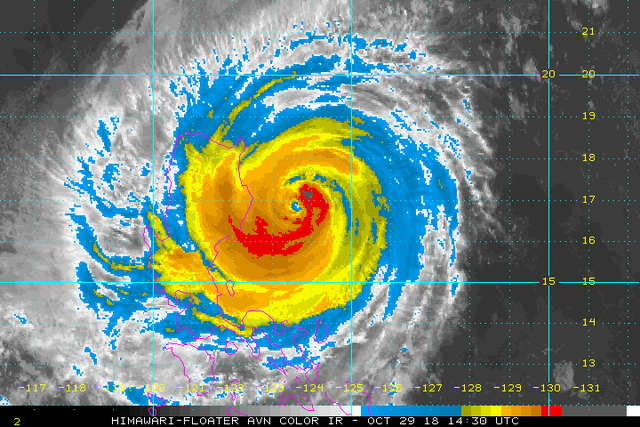 That was less intense than four days ago, when as a ‘super-typhoon’ with wind speeds of over 170mph it battered the Marianas, tearing off roofs, overturning vehicles and cutting off power and water. Authorities in Isabela and Cagayan provinces are now moving residents of coastal towns to evacuation centres while the mountainous Cordillera region has been put on red alert for landslides. Three provinces in northern Luzon are now on warning signal 3 (out of 5), and 28 more are on 1 and 2, with strong winds and rains expected later today. School classes have been suspended in at least five provinces and fishermen across the eastern seaboard have been urged to stay ashore. All boat services in the port city of Batangas have been cancelled today. The typhoon will be the 18th to hit the Philippines this year and comes just weeks after super Typhoon Ompong (Mangkhut) tore across Luzon, triggering catastrophic landslides that killed dozens of people.